This week’s episode of Tennis Quick Tips is the second in a podcast series called “Know Your Job in Tennis Doubles.” Too many people play doubles with very little idea about just what their job on the doubles court is. In this series, I’ll give you some quick and easy tips – basically your job description – and let you know what it is you should be doing when you’re on court, no matter what position you’re playing. In this week’s episode in the series, I discuss what I think is the hardest job on court in a doubles match – the job of the server’s partner. You can listen to this episode by clicking on the gray media player above. And you can read through the edited version of the transcript below for notes or to get more information. 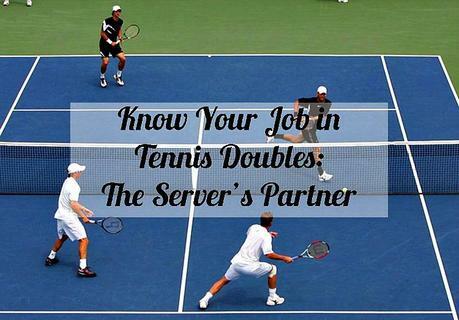 This week I’m talking about what I think is the hardest job on the doubles court – the job of the server’s partner. Why do I think this is the hardest job in doubles? Mainly because you see the ball well after the other three people on the court see it. The server and both of your opponents get a good look at the ball right as its served. You, on the other hand, won’t see it until it lands in the service box and therefore you don’t have quite as much time as your opponents or even your own partner to figure out just what your next move is going to be. Now, if you’re communicating with your partner, as you should be and as we talked about in the last episode, which you can find at tennisfixation.com/quicktips19, then you’ll have a good idea of where the serve is supposed to go and you’ll also have a plan about what you’ll be doing with the return. But if the serve didn’t go where it was supposed to go, or if, and I hope this isn’t the case, you’re not talking to your partner about where the serve is supposed to go, then you may be the last person on the court to have a reaction to the ball. So let’s talk about how you can try to avoid these problems and make the best of your job as the server’s partner. What is the job of the server’s partner? 1. Help your partner pick out a target for their serve. Although the server will most likely make the decision as to where they’re going to hit their serve, as the server’s partner, you need to assist in this decision by letting your partner know what you think of your opponents’ weaknesses and what you think you might be capable of when they hit their return. If you’re seeing returns that you think are poachable, you need to let the server know that and have them try to get their serves up the middle. 2. Be moving and ready before the return is struck. You cannot be flat footed and non-responsive when you are the server’s partner. You need to be on the balls of your feet, ready for action. Do not stand, unmoving, in your spot, thinking the return will be hit cross court to your partner and you’ll eventually get involved in the point. Instead, when the return is hit, have the thought in your mind that you WANT to get that ball, you WANT it to be your’s. That one thought can help ensure that you’re ready for whatever return comes across the net. 3. Worry the returner. This is probably the easiest part of your job yet is the least likely to be done. The best thing you can do as the server’s partner is to successfully poach the return and win the point. The next best thing you can do is to attempt to poach the return and, even though you may be unsuccessful, you get in the returner’s head. If you have been hesitant to poach in the past, you absolutely must at least try to poach. Because I promise you – even when your poach doesn’t work, the returner will be thinking about it on his or her next return and that next return will most likely go out from being hit too wide or go out from being poorly hit down the line. So do your job and worry the returner. If you want some great tips on poaching, check out Tennis Quick Tips Episode 2 called “Start Poaching Now” which can be found at tennisfixation.com/quicktips2. I’ll link to that in the show notes. Okay, so what’s the next part of your job as the returner’s partner? 4. It’s to be prepared if the ball doesn’t come to you and watch your opponent at the net. If the return goes cross court and is unpoachable, you should move off the net two steps and watch your opponent at the net. By watching the net player, you can get a really good idea of what kind of shot your partner has just hit. If the net person is moving forward towards the net with their racquet up and ready, you can should prepare for the ball to be smashed right at you. While this might not happen, be ready for it because that’s the worst thing that could happen to you. Anything else will be much easier to deal with. If the net opponent take a few steps back or calls out “Your’s” to their partner, you can guess that your partner has hit a deep shot cross court or a deep shot and you need to prepare yourself for your opponent’s possible weak shot that you might pick off. 5. Hit your volleys at the feet of your opponent at the net. Note that I did not say hit your volleys at your opponent at the net. First of all, that is not nice. Second, it is much easier for your opponent to stick out their racquet and deflect a ball hit waist height or higher than to bend down and get to the ball at their feet. Third, even if they do bend their knees and get that low ball, they can only hit it up, probably giving you an easy ball that you can then put away. 6. Communicate with your partner. I think this may be the most important part of your job as the server’s partner. No matter what is happening on court, no matter how bad your partner might be serving, you have got to stay positive, focused, and supportive of your partner. You cannot coach your partner and you cannot tell them all of the things they’re doing wrong. That is a recipe for doubles disaster. Rather, you make suggestions about what could work and where the serve could be directed. Above all, your job is to remain upbeat and focused, no matter what. So that’s the job description for the server’s partner. In the next episode of Tennis Quick Tips, we’ll talk about the job of the big job on the other side of the net – that of the returner. SUBSCRIBE IN iTUNES: Visit the TQT iTunes page and subscribe (click on the “Subscribe” button or the blue “View in iTunes” button) or search for “Tennis Quick Tips” in the iPhone Podcast app. SUBSCRIBE ELSEWHERE: Search for “Tennis Quick Tips” in your favorite podcast app. Or visit the TQT Stitcher page and subscribe. Or visit the TQT podcast feed URL and listen in. Thanks for listening and, as always, Happy Tennis!